Ah, babies. They're the best! This session was pretty awesome, as mom Shannon and I came up with a super fun idea for photos. Shannon and I actually went to high school together! I love when old friends come to me for sessions. It makes me so happy! Another small world fact, Shannon and my fiance went to elementary/middle school together. How funny is that?! For the fun photo idea, first you need to know something about me. I'm not only a huge nerd, but I love Harry Potter. Like seriously, I geek out over Harry Potter all of the time. I've read all of the books about 10x through, I went to midnight book premieres and movie premiers, and own a lot of merchandise. I may have even dressed up for a premier. Maybe. Told you I was a nerd. I've been waiting for someone to ask to do a Harry Potter session of any kind for years! 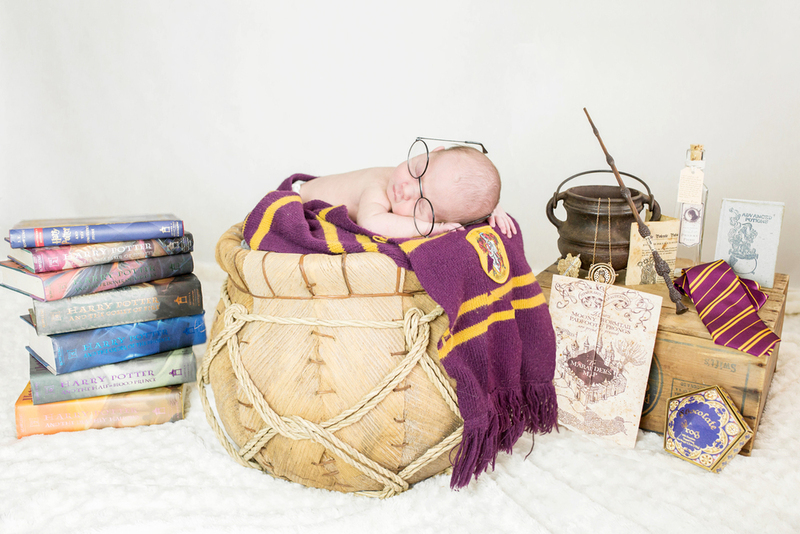 When Shannon contacted me about taking her babies newborn photos, knowing she too was a big HP fan, I asked if she wanted Harry Potter themed newborn photos. She said yes, and I'm pretty sure I squealed with delight. I planned it out all in my head; I collected all of my props from my house, and a friend let me borrow some of hers as well. The end result was better than I imagined, and I absolutely love them. Plus, Harrison could be called Harry, which how even more perfect is that?! Wait until you see the photos! Harry Potter fans will love all of the fun little props I used. Of course we didn't do ALL Harry Potter photos, even if I wanted to. I took some regular baby portraits, and some with some fun hates Shannon, and I provided. I also took some fun family photos, including some with proud big sister/dog Penny. She was so well behaved for the photos! I love when families include their pets in photos. They are family as well. Being a cat owner and lover of animals, pets always have such a special place in my heart. Here are some of the photos from Harrison's session. I hope you enjoy them!